It is with some concern that I found myself reading Sarkozy’s latest proposal – the creation of a Council of Wise Men to ponder the future of Europe. The man who is touted as being in favour of women’s equality, who has half a cabinet of women (his so-called 'babes') and has traded in one intelligent lady for a younger, leggier but dumber model (she is the one who gained extensive column coverage after claiming on her recent state visit as newly married Mrs Sarkozy that she would like to have a bath with Tony Blair). So, here we have it, 80 years on since women won the right to vote on equal terms with men, and the start of democratic representation as we know it today - 100 years after the suffragettes fought in this country for those equal rights (and a mantle in their honour I was carrying, just the previous night in Parliament Square), one of the highest profile men in the world (the EU presidency is currently vested in France) has determined that his Council for such weighty matters would be manned by well, men! The implication being that there are no women up to the job, that Sarkozy's women are for the pleasure of the eye, but little more. Certainly this is the case when it comes to weighty matters of the EU. But maybe he allows a little lassitude of the non-political persuasion when at home. How very French. I put this very issue to a panel of women in the House of Commons last night, who were discussing why so few women are in politics (No Politics Please...We're Women!). I asked them to comment on this decision. One response came back that made me sit up, from fellow celt Lee Chalmers of the The Downing Street Project. She suggested that a corresponding Council of Wise Women be appointed - and see what issues they thought important to ponder upon - and then bring the two together. This make a lot of sense on numerous levels. Firstly, women do approach politics in a different manner. As Helen Goodman MP pointed out last night, we think differently, we have a different agenda, we have a different style. This is not mere observation, but is fact. Investigations have established that from the age of seven, males and females develop differing approaches to the concept of reason. Males, it was discovered, are more linear in their thinking - issues tend to be either right or wrong. Whereas females diverge and become more holistic, and therefore find it difficult to answer a moral question immediately. Look how this plays out in politics, even today, with the cut and thrust and subsequent reportage on politics. One of our broadsheets presents a boxing scoring on politicians on the issue of the day. But this is not to say that women are not suited to our masculine, male dominated political world. Decisions are at the end of the day taken in multi-lateral institutions. It's about coalition building, and women are very good at doing that. Look at Angela Merkel, she is exceptionally effective in this arena. Women network on multi and numerous levels, cross referencing and supporting. Secondly, can a man ever properly represent a woman? Is it practical, do they have the drive to represent women's interests? To really understand and be in a woman's shoes - you really have to be a woman. I agree with Lee, it is not simply a matter of either/or, but a matter of balance - of both male and female - if we are to benefit for all and our future, tackle trans-boundary issues such as global warming, food, poverty. That's why I set up Wise Women, my network of women who care about creating a more sustainable and environmentally benign world - to start to redress that imbalance, and facilitate more women in becoming comfortable with their voice in what is still predominantly a man's world (in this case with regard to the environment). This is not to say we need less men, but rather that we need more women stepping into leadership roles, now more than ever. It has been statistically proven that countries that have higher participation by women in politics do better and correspondingly encourage more balanced decision making. If Sarkozy was setting up his team within a company context, he would quite rightly be accused of bias and discrimination. I am if nothing but a lawyer with years of experience in the employment courts. Discriminatory behaviour is something I understand well. Yet for some reason, when it comes to the larger stage, such rights which have been hard-fought for are so easily disregarded. Not one country has taken issue with this anomaly. 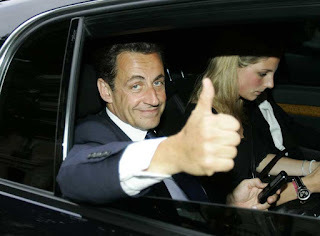 Why is Sarkozy allowed to do this? The EU, that so prides itself in being transparent and accountable after the debacle of the corruption they swept out in the late 90's, has just demonstrated - that when it comes to the crunch - once again it is jobs for the boys. I have set up my own Council of Wise Women, and I invite Mr Sarkozy to join us. Maybe that way we can find a way forward for us all. Is Mr Brown for Turning?